Do you want own a part of the robot future? 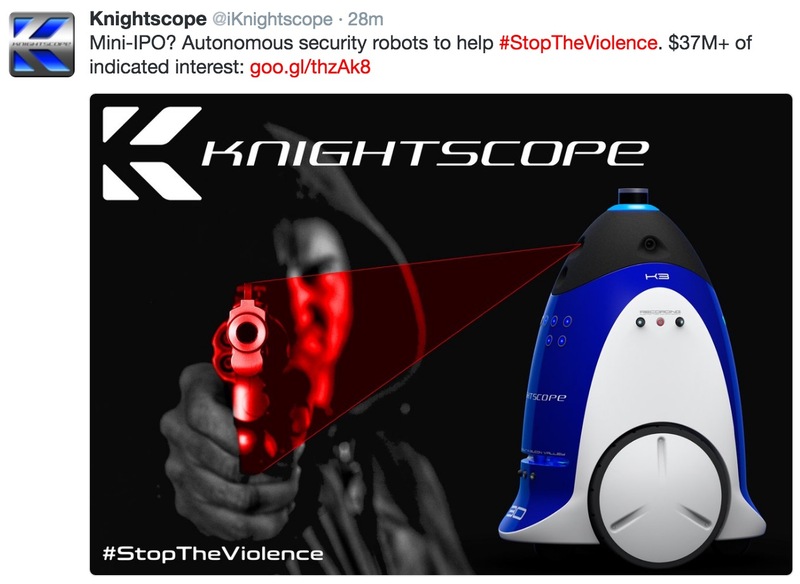 After gaining international fame with their robot runs over child debacle, Knightscope is seeking new funding through what they are calling a "mini IPO to test the waters". We spoke with Knightscope CEO William Li to get more information about why the company wants to raise money from individual investors instead of the Silicon Valley VCs all around them. ** *** **** *** * **** ** *** ***** ******? ***** ******* ************* **** **** ********** **** **** ***** *******, *********** ** ******* *** ******* ******* **** **** *** calling * "**** *** ** **** *** ******". ** ***** **** *********** ********** **** *** **** *********** ***** *** *** ******* ***** ** raise ***** **** ********** ********* ******* ** *** ******* ****** VCs *** ****** ****. *********** ** ***************, * *****-******* **** ******* ** ***********, ** ****** ******** interest. ***********'* ******** **** **** *********** *************** ** ****** **** ***** **** ** ******. ***** ******* are ***-*******, *** *** ******* *** ****** *** ** ******* explore **** **** ** ******* ******** ** *** ***. ** ********** **** ** ********************* ********* *** ***** ** * $*/** **** **. $**/** for * *****. ** ** *********** ** *********** ******** ** ***********, *** ****** ********** ** *** ********, ****** *** **** for ****** **** ****, *** *** ***** ******* $* ** hour **/*/***, **** ****** ***** ** *** ****** ** ** being ******* ** **********. *********** **** ****'** ***** ** $*** ** *** ** ******** rounds (********* * $*** ***** **** *** ** *** ******* of **********), *** **** ** ***** ********** ***** ** **** new ****** ** *** *******. *** ******* ***** ** *** software **** *** ****** **** **** ** ******* ** ****** in *** *****'* ***** ** ****, *** **** **** **** to **** ******** ** ********** ***** ** ******* *** ********* with ****** ********* *** *********. ****** ********* *** ********* **** **** ****** ********** **** ***********, according ** *** ***, ** ****** *********** ***** ** ******* corporate, ******, *** *********** ******** ** **********. *** ***, *********** is ******** *********** ** ********** ** ***** ** ****** ****** sales *** ******* ******** *** ***** ********. *** ******* ************ that ****** *** ***** ** * ***** *********** *****, *** being **** ** ***** ******** ***** ****** **** **** **** manage ***** *** *********. *** ******* ***** ***** ** **** **** *** ******* ** determine ******* *********. ** **** ***** ********* ********* **** ****** guidance ** ***** ** **** ***** ********** ***** **** **** in *** **** ** ***** ** ***** **** *****. ********* may **** **** **********, ** **** * ***** *********** ******** outlines **** **** ********** **** *** *** ** ******. ***********'* *** **** **** ***** ******* ****** **** **************, *** VC ********* **** **** ******** ****** *********. ******* **** **** money, *** ** *** *********** **** *** ******** ** ********** in *** ******** ******** ** **** *** ******* **** ** advisory ***********.  **** ** **** ** *** ****** *********** ** promoting *** ********** ********, ** *** *** ******* ***** ******** that *** **** **** ***** *** ********* ** *** ******** Knightscope ** ****** ** *****. **** *********** *** ******** *********** *** *****, *** *** ********* in ******** *** **** * ******* ***** **** *** **** well. *** **** ** *** **** *********** *******, ******* ********** small **** **** ******** ** ********** *********, **** **** **** $100 *******, *** ***** ********** ** **** ****** *** (***:*** **** ** ****; ***** **** ** ****). ******-*********** ************** ************* ******** ** ****. ********** ********* **** **** **** ***** ** ***** *********** ****. People seem to forget all the other things that companies have guards doing...like responding to first aid incidents, de-escalating in tough situations before they become violent...the tech is there but their understanding of the problem isn't mature enough yet. 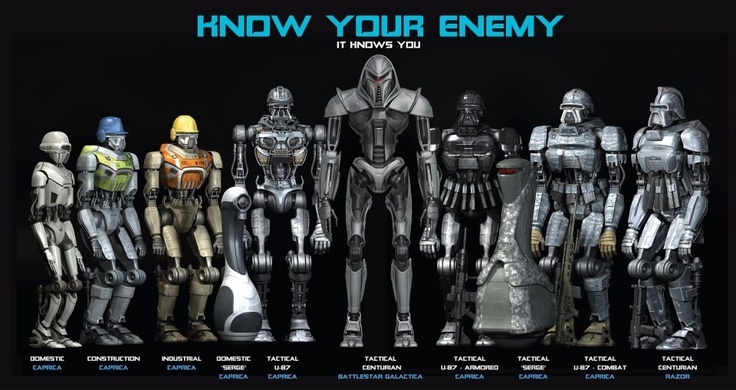 To that end, I think the best tactical approach to security guard robots is make them very inexpensive and not positioned as a guard replacement. That $7 robot vs $25 guard comparison is not going to fool many people as it is easy to see what the tradeoffs are. 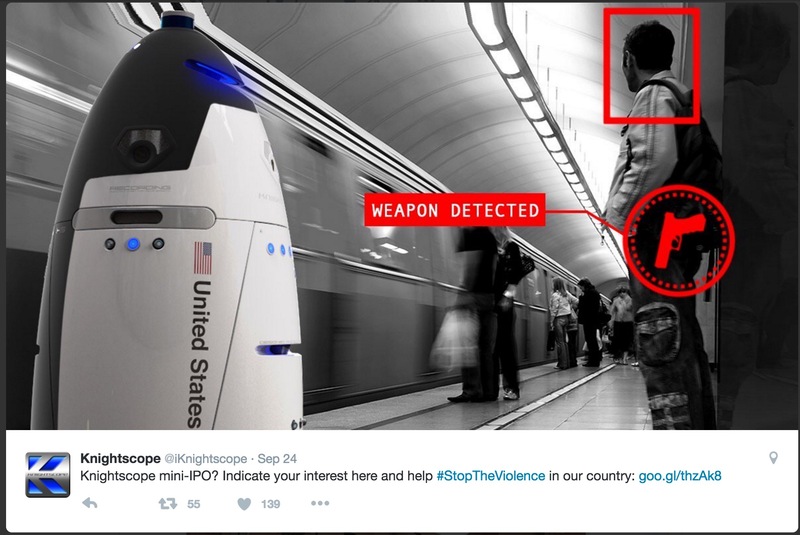 A robot at $6,000 a year (instead of the $60,000 Knightscope charges) would be a lot more viable. Even without gun detection and chemical analysis and whatever super sophisticated capabilities they hope to build in, just produce a basic camera / audio roving device and let it be a low cost complement to guards, something effectively between a PTZ and a human. I'm refraining from voting as I'm afraid my objectivity has been compromised at the thought of TOTALLY REAL SECURITY ROBOTS YOU GUYS OMG. 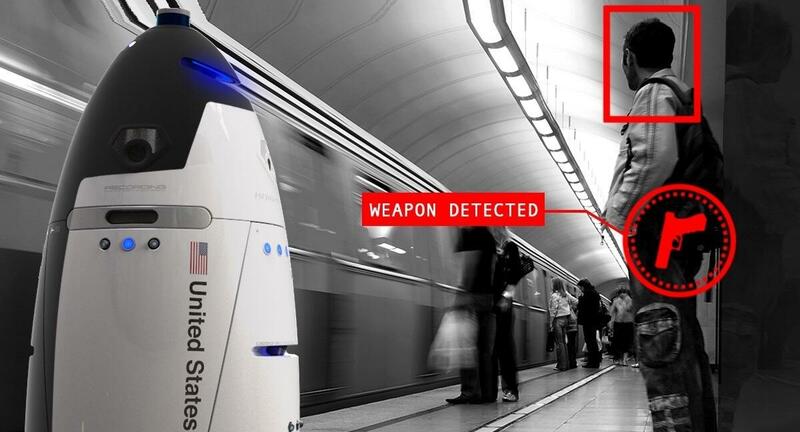 Note: we are going to stop doing posts on security robots unless there is some major breakthrough. 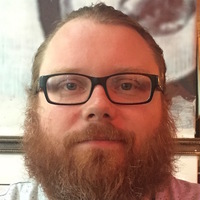 The reads on these posts are very low, indicating most people simply do not care, which is probably a reasonable 'wisdom of crowds' metric given the current state of offerings. This is awesome however Scot makes a great point. The actual approach to a possible violent situation between multiple people a robot will never be able to handle. Cant wait to see development in the future however. A fire exhausting robot which detects humans trapped inside burning buildings and gives oxygen automatically would make sense for me, nothing else. ...inside burning buildings and gives oxygen automatically would make sense for me, nothing else. I assume you mean that the robot would extract breathable air from the smoky surroundings and provide to humans, thereby avoiding carrying O2 in a burning building as well as reducing the oxygen available to the fire. Can't someone just mount a wireless camera on one of those robot vacuums? Then they could replace the guards, and the janitorial staff too. That's a lot more savings! That's funny, but... The Dyson 360 Eye actually has a panoramic camera. I think there's a Samsung camera model, as well. Did my best to avoid posting this, but can no longer hold out. Sorry. This Mini-IPO interest thing is a joke. Before, it was at $37.9 million and after I indicated my interest, it was accepted and went to $38.4 million. What is the point of this metric at all? Perhaps mrroboto will be getting cameras from mrmoboto, aka mobotix, aka koinica minolta? They can detect weapons now? I saw that pic this morning as well. No, they cannot detect weapons, unless something has recently changed, but this is an area they want to expand to with the "mini IPO" money (mentioned in the article above). Detecting visible weapons is already very challenging, detecting invisible ones seems like a monumental task. What was the context that this picture was shown in? Which, needless to say, makes it even more reckless. And yet, perhaps not that far-fetched. The company you cite has raised $19 million or more in VC funding just for such gun detection development. 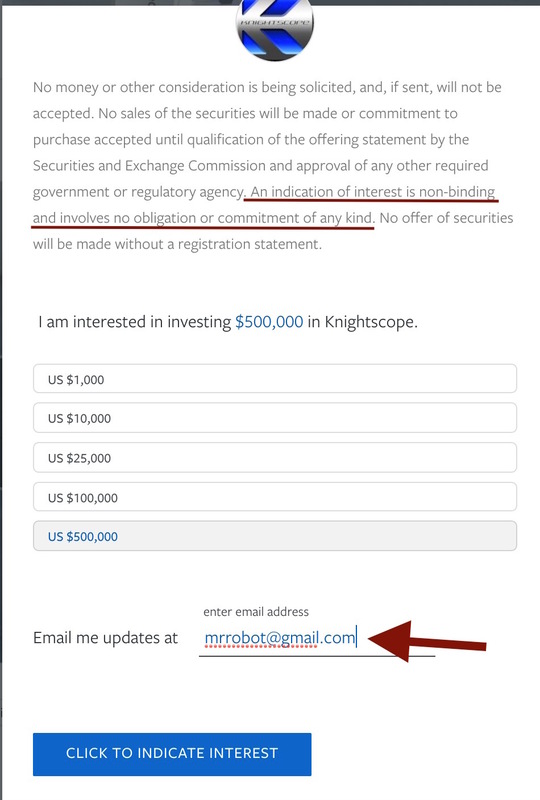 You are now able to formally invest in Knightscope. They are doing this as a Tier 1, Regulation A+ offering. 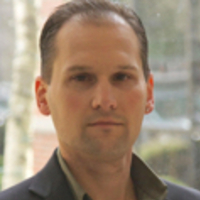 Knightscope is looking to raise $20M, the maximum allowable under Tier 1. 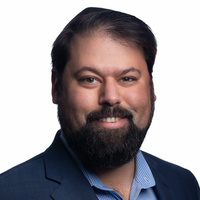 A Tier 2 offering would allow them to raise up to $50M, but would also require the company to provide audited financials and event updates. 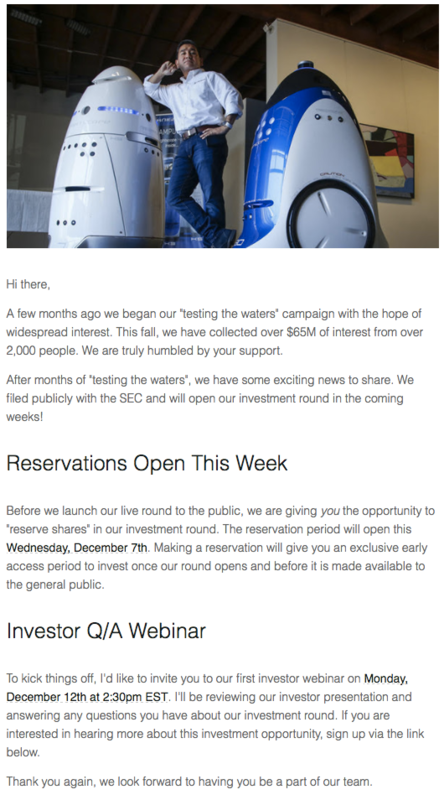 If you "expressed interest" in the early round, as I did, then you have probably also received multiple emails from Knightscope about the mini IPO going live. I have over 2 dozen emails from Knightscope/Seedinvest encouraging me to "take a stand against crime, violence, and terrorism" by investing.